Tredyffrin Public Library's monthly evening book club which celebrates a love of ecclectic literature, lively conversation, tea, and delicious treats! I’m sorry to say that I missed out on the conversation for Lysistrata and Assembly Women in February since I had to cover our reference desk last minute. Thankfully, Steeper George (who chose the plays for our group) was able to step up and lead the discussion that night. I was, however, still able to provide a treat for the evening. 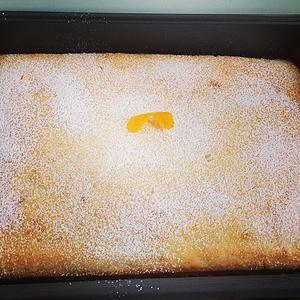 I did a search for recipes that were made with Greek yogurt and found one for a pretty easy-to-make orange cake. The Greeks call it “Portokalopita,” I call it “Very tasty.” The orange flavor was very strong, but I like that. I think it would have benefited by some vanilla ice cream or some whipped cream for a nice creamsicle flavor. What an awesome conversation about #maisiedobbs tonight! I made lovely London Fog shortbread cookies and served it with one of my favorite teas, a black vanilla lavender. The group gave Maisie 3.25 teacups outta 5. The last pic is my mug.